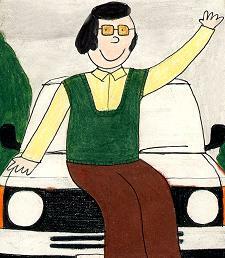 Des is the undoubted star of 'The Chronicles of Des and Mick'. Without him, the other residents of Oakleigh Avenue in Tolworth, Surrey, would probably be living an untroubled, care-free existence. But with Des in your life, there is never a dull moment. He is prone to coming up with daft ideas that never have a hope of going right. Des means well, but he is perhaps a little naive. Brought up by his Aunty Phyllis, Des has not worked since he was eighteen, being a millionnaire. He was attending dustman training school when his Great Uncle Big Tim Cheese Wednesday died in a freak collision with a fridge and inherited a huge sum of money. However, he rarely spends any of it, and is happy to live in an ordinary house in suburbia. Des is stuck in the 1970s. He still wears his tank tops and flares with pride, and won't get rid of his wraparound haircut and sideburns. 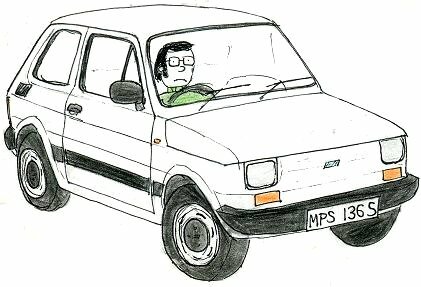 He loves chocolate biscuits, is extremely rich, and still drives his beloved Fiat 126. Des has also worked his way through various additional vehicles, from a Transit van to a Routemaster bus, a milk float and a horse box. Musically, Des favours Abba, Chicory Tipp, Kajagoogoo and A Tribe of Toffs. Click here to see Des's all-time top ten records. Favourite saying: "I've got a brilliant idea!"